Sorry, Penny and Leonard. You’ve been hoisted by your own insincere gift-giving petard. Amy and Sheldon have returned from their honeymoon, and are getting down to the business of opening wedding gifts and handwriting thank-you notes. We don’t see any of the other nuptial booty, but the couple happily opens a present from BFFs Penny and Leonard, who’ve attached a gift tag that reads, “The perfect gift for the perfect couple.” Sheldon puts the card aside for safekeeping — “We’re gonna wanna throw [that] back in their faces,” he says of being called “the perfect couple” — and he and the new Mrs. try to guess what could be inside the long, rectangular gift box. “A flute? A letter opener? One of those pens where you put the bikini back on the naked lady?” Sheldon suggests. But he rules out the possibility that the glass object is a Westworld collectible, and Amy suggests maybe it’s some sort of marital aid. “Don’t be silly, Amy! How is this big, glass shaft going to aid our marriage?” Hmmm, naked lady bikini pens, big glass shafts … married Shamy is a friskier Shamy! But back to that puzzling prezzie. They have no idea what it is, and the mystery is keeping them up at night. Sheldon is fixated on Penny and Leonard’s claim that it is “the perfect gift” (and yet, it isn’t a dinosaur fossil or matching pocket watches). Sheldon wants to ask their friends what the glass object is, but Amy says it would hurt their feelings. That’s a hard No. Shamy then decides the glass rod must be some sort of clue in a scavenger hunt that will take them to their real wedding gift. After a brief visit with fellow professor Bert Kibbler, who tells Shamy the object is a quartz crystal, the scavenger hunt they think they’re embarking upon leads them to the coffee shop where they first met and into the coffee shop’s lost and found box, where they locate a locket they think was left there for them by Penny and Leonard. The locket is empty, because, they assume, it is meant to be filled with their memories. And the box contains a pair of sunglasses, which Sheldon thinks is also part of the gift, because his and Amy’s future is so bright. They’re thrilled and touched by their friends’ sentiments. Meanwhile, at lunch in the CalTech cafeteria, we learn the truth behind the crystal. It’s been regifted, several times. Raj originally gave the crystal wand to Howard and Bernadette as a wedding present, a sincere offering he hoped they would like. They didn’t, and passed it along to Penny and Leonard for their wedding. 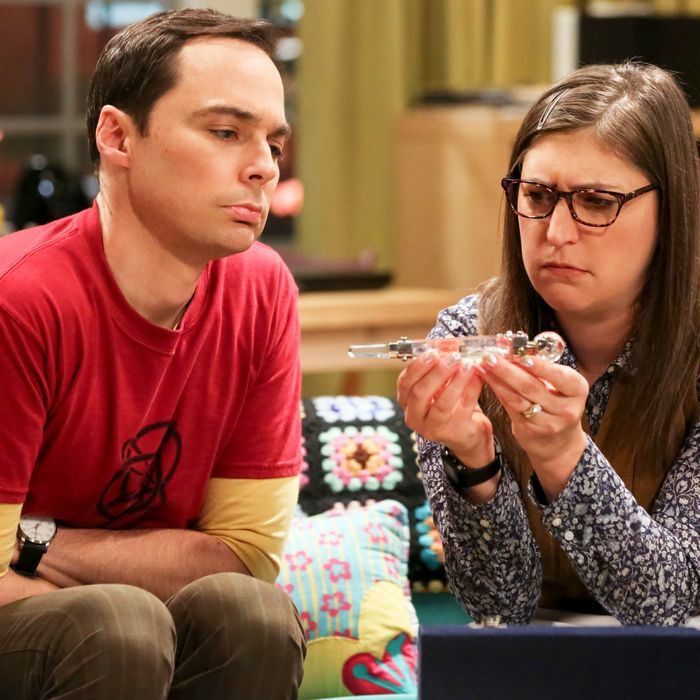 Penny and Leonard wrapped it up for Sheldon and Amy, not only because they didn’t want it, but because they knew it would flummox and torment the newlyweds. Penny and Leonard don’t tell them the truth, happily, because really, who would look like the asses, here: the couple who naïvely but genuinely believe their friends gave them a thoughtful gift to celebrate their marriage, or the clowns who cynically marked their friends’ wedding with a regift and a practical joke? The clowns get a little extra thank-you from Shamy: a note, written in a code, that Penny and Leonard must crack. In an effort to give Lenny the same kind of bonding adventure they were given, Sheldon and Amy locked them out of their WiFi, and only deciphering the note and learning the code will get them back online. Nicely played, TBBT writers. That’s some Larry David-level petard hoisting right there. In the B-storyline, Stuart is front and center, as his crush on his comic book store employee, Denise, appears to be mutual. Denise agrees to go on a date with Stuart, who arrives to pick her up with a weird new hair color and even weirder skin color thanks to an unfortunate, but well-intentioned, spray tan. But Denise — who, earlier, engaged with Stuart in a lengthy discussion about whether or not Superman would require a baggie to dispose of his doggy’s doo — is smart, funny, into the same pop culture as Stuart, and appears to find his Stuart-ness charming. Is it possible that Stuart could connect with a permanent love match before ever-lonely Raj does? Raj is ready to step up his search for a love match, too, and now he’s pulling out all the stops; he calls his dad and asks him to facilitate an arranged marriage. Papa Koothrappali agrees, on one condition: Raj must stop posting pictures of himself and his dog, Cinnamon, on Instagram and all other social media. Specifically, photos of himself and Cinnamon wearing matching sweaters. • The prospect of dating his employee leads to an awkward exchange for Stuart when Denise leaves the comic book shop and he, unsure whether to hug her or shake her hand, ends up patting her on the head, instead. She pats him on the head right back. What does it all mean, Stuart wonders.